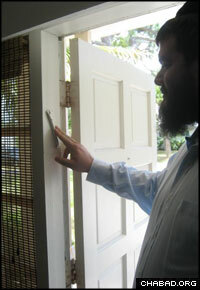 A women’s halfway house run by the Jewish Recovery Center in Boca Raton, Fla., supplements regular site visits by a counselor with personal interaction with Frumi Kessler, a Chabad-Lubavitch emissary. Recovering from addiction is difficult, and made all the more cumbersome if one is part of a community that for years was all too quick to sweep such problems under the proverbial rug. Just ask Eitan, a 54-year-old man who grew up as an observant Jew in the Brooklyn, N.Y., neighborhood of Borough Park. Name the addiction, and he’s struggled with it. Not Rabbi Meir and Frumi Kessler, directors of the Chabad Humanitarian Center in Boca Raton, Fla. The couple moved to South Florida three years ago as Chabad-Lubavitch emissaries and quickly found themselves catering to an expanding group of recovering addicts and people dealing with dependency issues. Soon after, they founded the city’s Jewish Recovery Center. One of them was Eitan, whom Kessler befriended at the Renaissance Institute. The couple invited the man over for Shabbat dinner, one of their signature programs. When Eitan’s mother passed away six weeks ago, the rabbi helped him pack so that he could move from his apartment in Delray Beach to be closer to family in White Plains, N.Y.
“Meir is a unique, wonderful man,” says Eitan, who has been sober for two years and still speaks weekly to Kessler. Chabad-Lubavitch Rabbi Meir Kessler founded the Jewish Recovery Center with his wife Frumi when they saw a growing spiritual need among recovering addicts in South Florida. At the Jewish Recovery Center, people are welcome to stop by and chat, and attend meetings with others in similar situations. A women’s halfway house established by the center two years ago offers housing for those who have been sober for at least three months and are seeking to transition back into society. Frumi Kessler and a professional counselor visit the home’s six women regularly. In addition, a men’s halfway house is set to open in two months, along with a clubhouse for those not looking for residential services. One of the center’s plusses, says Eitan, is that it doesn’t try to do too much. The Kesslers do that, adds Eitan, but they also known when and where to refer people for more intensive help. “We created the Jewish Recovery Center to help” those recovering from addiction, says the rabbi. Many are already in rehabilitation programs, he notes, and “by strengthening their Yiddishkeit,” the center provides a spiritual focus that further motivates them to change. The planned clubhouse will allow the bulk of the center’s programs, which currently take place at a synagogue, to branch out into a more comfortable setting. It will be “a place where Jewish people can hang out and have a place of their own,” echoes Eitan, who donated furniture for the clubhouse, as well as bicycles for the halfway houses. The Kesslers’ weekly traditional Shabbat dinner – where grape juice graces the table instead of wine – for 30 guests will continue to be a regular draw. “The meals are very special, very moving,” says the rabbi, noting that it presents a unique time to witness the tremendous changes taking place in those struggling with addiction. “These people are changing their inner characteristics. It’s not just a superficial thing. “To see change in front of you every day is very powerful,” adds Kessler. Looking to the future, Eitan – a divorced father of four – hopes to find peace and help others do the same.